Successful patient safety programs start with ensuring every room is equipped with appropriate preventative measures designed to reduce the risk of falls, tripping, nighttime disorientation, and other wandering-related injuries. 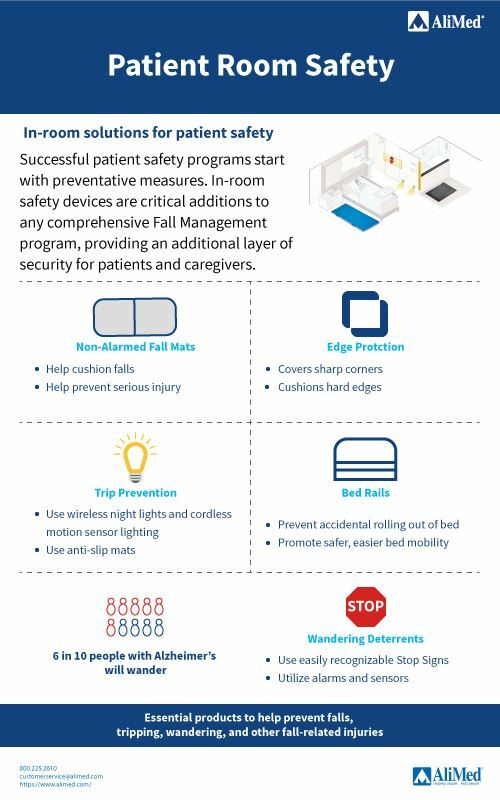 AliMed's wide-ranging, in-room safety devices are critical additions to any comprehensive Fall Management program, providing an additional layer of security for patients and caregivers. Non-Alarmed Fall Mats — These impact-absorbing, durable mats help cushion falls and prevent serious injury. 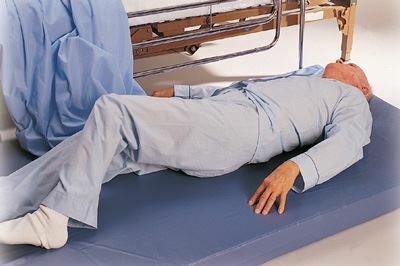 With a variety of thicknesses and styles— from ultra-thin, low-profile or multi-foldable, easy-to-store designs, to easy-to-clean, heat-sealed seams or slip-resistant nonskid bottoms—you'll find a mat to fit your patient's needs. Bed Rails — AliMed offers an extensive selection of bed rails including traditional models to prevent falls when getting in and out of bed, and transfer handles to promote safer, easier bed mobility while lessening the risk of injury to both patients and caregivers. Bed safety rails assist in preventing accidental rolling out of bed and can be used in conjunction with other precautions to prevent head or limb entanglement and bruising or skin-tear injuries commonly caused by danger zone gaps in bed. Edge Protection — Strategically placed, customizable edge protectors—including high-visibility color options to alert patients—securely attach to furniture or doorways and soften sharp corners and hazardous edges, adding another layer of protection for wandering or disoriented patients. 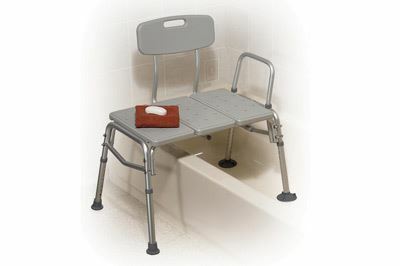 Gap stuffers, Bed Bolsters, and Geri-Chair Positioners and Cushions go to the extra step, shielding against hard side rails and bed frames to prevent pressure sores and other skin-related injuries. Trip Prevention — Anti-slip maps, wireless night lights, and cord management devices such as ties and floor covers provide a second line of defense against common tripping threats. Cordless motion sensor lighting illuminates pathways and eliminates nightime tripping hazards for caregivers, wandering patients, and frequent risers. Wandering Deterrents—Implementing a deterrent program utilizing door and window alarms, wireless or motion detectors, bed or chair sensor systems, and easily recognizable signs, provides effective and reliable safeguards against wandering.